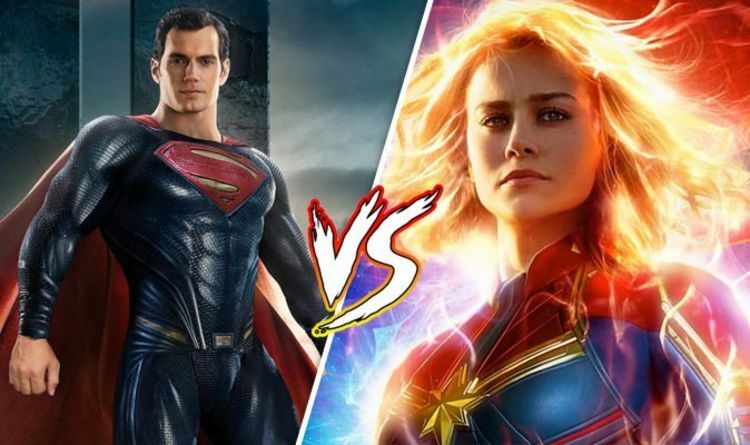 Celeb Gossip News – Captain Marvel vs Superman: Who is more powerful? Who would win in a fight? Captain Marvel is being touted as one of the strongest superheroes in the Marvel Cinematic Universe. A plethora of fan theories have already been written which put her at the centre of the plan to resurrect the fallen Avengers. With a huge arsenal of superpowers at her disposal, and Marvel boss Kevin Feige confirming she will be the new face of the MCU, it seems indisputable: Captain Marvel is inimitable. Who is more powerful: Captain Marvel or Superman? Superman and Captain Marvel will likely never meet. Not in combat or on the same side; they exist in two separate universes. Superman is a DC Comics hero, whereas Captain Marvel is – as her name suggests – a Marvel hero. But if there were to be a fight, it’s likely Captain Marvel would win. Though Superman is impressively strong – indestructible, even, Captain Marvel has one power which could best him. Captain Marvel has the ability to absorb energy and turn it into power. If Superman were to use his heat vision on her, Captain Marvel could absorb this. Then she could hit him back with a powered-up version of his own heat vision blast. Another advantage Captain Marvel has is her ability to enter a state called Binary. As Binary, she is able to tap into the energy of a white hole (the opposite of a black hole) which would give her full control and manipulation of stellar energies. She would, therefore also be able to control heat waves, the electromagnetic spectrum, and gravity. Binary also allows her to reach light speed travel and the ability to survive in the vacuum of space without aid. Captain Marvel also has a prescience which Superman does not have. An ability to predict, however subtly, Superman’s next move would give anyone an advantage. In the hands of Carol Danvers, this advantage is deadly. Superman only has a couple of weaknesses, which is what makes him so powerful. But Captain Marvel has access to one of the few weaknesses he has. In her Binary state, Captain Marvel can access all solar radiation. One of Superman’s weaknesses is red solar radiation, which Captain Marvel could use to drain him of his powers. So, yes, Captain Marvel could likely beat Superman in a fight. But in all likelihood, we’ll never have to know for sure. Captain Marvel is out on March 8, 2019.